I work in the popular model railway scales - 7mm, 4mm & 2mm. I have also painted stock in G scale, gauge 1 and S scale. Due to the volume of work I have in hand I am unable to take further orders or give quotes at the moment to new customers. The site is updated from time to time so please enjoy the photos and links. Ex LMS 2P 4-4-0, not much more to do. 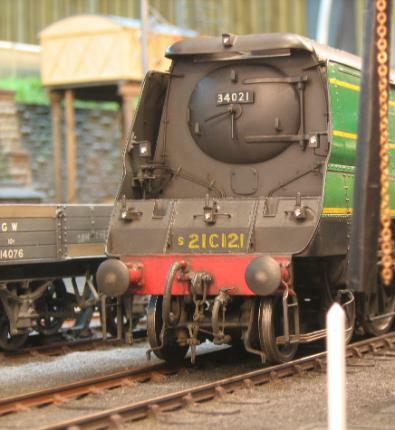 Warley Open Day 17 Feb. I have added a page called 'Most Recent' so you don't need to trawl through the galleries to find the new gallery photos. It will include half a dozen of the most recent projects. contact me. But not for quotes to new customers as I am not taking on new work at present. The photographs in the galleries are all models that I have painted (except some which are 'lining only' where the builder has done the main painting; these are noted). Some of the models have been weathered after delivery - in most of these I credit the person who did it. I also try to credit the builder when I know who it is. If you see something you think you should be credited for, let me know. The photographs in the galleries are in alphabetical order of the livery carried, and in number order within that. There are some exceptions, the main ones being diesel, electric, industrial and Irish locomotives in the 4mm gallery which come under D,E & I. Since publication the Modeller's Handbook of Painting and Lining has become the definitive work on the subject and has had many favourable reviews in the model press and on the Web. It is published by Wild Swan and is available from them, booksellers at exhibitions and on the Web. The 'Right Track' series of DVDs has become the market leader in providing practical advice to railway modellers. Edition 3 covers Painting, Lining and some simple methods for Weathering . The more elementary procedures are covered by the well known modeller and photographer Tony Wright while Ian Rathbone covers the more sophisticated techniques for spray painting and lining with a draughtsman's bow pen. It is an excellent companion to 'A Handbook of Painting and Lining' as it shows the work actually being done instead of just described. This video is sometimes available on Youtube.